Written by Ghanshyam Shah, Democracy, Civil Society and Governance focuses on the interplay of democracy, civil society and public policy implementation, and addresses the role of civil society in terms of the changing nature of the economy and the condition of the working class. The following is an exceprt from the epilogue of the book as well as a conversation between Ghanshyam Shah and Daniya Rahman, a member of the editorial collective of the Indian Cultural Forum. Daniya Rahman (DR): Can you elaborate on the distinction between Hegemonic Civil Society and Radical Civil Society? Ghanshyam Shah (GS): Hegemonic civil society reproduces and perpetuates hierarchical anti-egalitarian values and particularistic tendencies. It legitimises the political economy and social system that breeds inequality and strengthen the power of dominant classes/castes. It nourishes institutions, policies and governance in favour of the prevailing socio-cultural, economic and political power relations in society. Radical civil society, on the other hand, questions and challenges the present neo-liberal political economy, hierarchical and particularistic values and norms reinforcing inequality. It often confronts the state and dominant classes/castes and strives for changing the existing power structure. DR: If, as you have also said, the organisations belonging to the Hegemonic Civil Society are "susceptible of getting co-opted by the state and dominant classes", how can they protect the democratic values that are being attacked by the same dominant classes? GS: They cannot and do not. They at the most express their uneasiness or helplessness. They are concerned for formal democracy. Once in a while, few of them express their uneasiness and helplessness and occasionally protest when democratic values are blatantly violated by the state and dominant classes. DR: While some believe that state intervention is a must in our society, others are of the opinion that the state should have minimum role in affairs of society. Can you talk about the correlation, if any, between the role of civil society organisations and the need for state intervention to bring equality in society? GS: Those who believe that the state should have a minimum role in the affairs of the society, they, I submit, wish away the existing power centres in the society which perpetuate inequality and primordial mindset. They are for the status quo in favour of dominant classes/castes and patriarchal system. The Indian Constitution has directed the Indian State to build an egalitarian society embedded with individual freedom and fraternity. It is also the people’s mandate to the State. The present dominant castes and classes are obstacles in the path of an egalitarian social transformation. They not only wield power, but also reinforce and reproduce cultural values legitimising inequality. It is the responsibility of the State to evolve policies and mechanisms to dismantle these forces and their institutions, cultural ethos and value system influencing everyday life. It is a task of the state of transforming society by democratising and empowering the oppressed and deprived sections. It is the primary task of a civil society to keep watch on the observance of public morality and raise voice and confront the state, political parties and sectarian groups subvert democratic moral canons. Civil society has to be up in arms if the state violates the liberty of the citizens and imposes unlawful restrictions on individual autonomy. On the other hand, it supports those policies and programmes of the State which empower the oppressed and instil consciousness for their rights and dignity. It builds pressure on the state for expanding rights of the have-nots. Simultaneously, it confronts the state for its policies that protect and strengthen the status quo in favour of dominant classes/castes. While doing so, civil society also interrogates and challenges hegemonic values that reinforce hierarchical, primordial and discriminatory values. In the process, counter values validating equality and liberty are articulated, promoted, popularised and practised. With the reflective critical approach, civil society constantly questions itself, society and the State in a different situation on various issues concerned for the common good. Moreover, with political agenda for an egalitarian social relationship, the civil society gets engaged in political issues – raising problems, aspirations and needs of the people, injustice meted out to them etc. In order to actualize the rights enshrined in the Indian constitution, they need to be legalized. This is being done not only by public discourse and advocacy with policymakers, but also conscientize people by involving them in the process of lawmaking. For that, civil society supports and also participates in public protests and struggles against the oppressors in everyday life. With this theoretical framework, I examine the empirical situation. DR: Why did you choose to focus on the civil society of Gujarat specifically? GS: One obvious reason for me to study the civil society of Gujarat is that I am more familiar with the region. The more important theoretical reason is that it strengthens my theoretical argument about the hegemonic role of the mainstream civil society in legitimising the present capitalist system. As I have mentioned in the book, it is one of the leading federal states of India in the neo-liberal political economy. The idea of Gujarat in the public minds ever since the writing of modern Gujarat in the 19th century (by intellectuals- litterateurs, History writers, social reformers etc. ), is a land of entrepreneurship. Gujarati culture has been repeatedly projected as the land of business conducive for a capitalist system. It is now de facto majoritarian Hindu state. The mainstream civil society has produced, reproduced and legitimised these value systems since the mid-19th century. Today, the mainstream civil society and the state work hand-in-hand. What I have mentioned in my response to the previous question is a normative theory of civil society – our expectation. Therefore, I have qualified civil society into the mainstream, hegemonic and radical which has a small space. With the financial support from international organizations such as the WB, UNDP, DFID (Department for International Development, UK) and other funding organizations, a large number of NGOs have entered in the civil society arena for ‘development’ work and for good governance. They believe that professional expertise and participation of stakeholders with accountability and transparency in governance is the royal path for development. Besides support from the international funding agencies, some NGOs collaborate with the union or the state governments in the form of PPP. They work at different levels and segments, including infrastructure such as roads and transport, water management, solid waste management, skill development, vocational training, agro-business, credit, sanitation, health, education, shelter, etc. The parameters of ‘good governance’ have been actualized in a few cases where the stakeholders are from the rich and middle class. Participation of poor stakeholders and accountability of the govern- ment have remained on paper. More importantly, PPP has sidelined political leaders and has legitimized the depoliticization process (Ghosh et al. 2009). These NGOs do assist the poor to add some income and to sustain life so that cheap labour remains available to the propertied classes. Not only that, they make the poor feel guilty if they are unable to develop their skills and capacity to meet the needs of the market. Thus, large segments of the pro-poor civil society engaged in welfare programmes unwittingly socialize the poor to the market, ‘by promoting the acquisition of certain behavioural patterns and decision-making preferences and by supporting the functional social networks needed for markets to operate smoothly’ (James Busumtwi- sam 2002). As these activists and their organizations, including of RCS, carry out the welfare programmes unreflectively, despite their dislike of capitalism, they inadvertently promote a capitalist culture and legitimize the neoliberal economic system. However, the organizations with a rights-based perspective use these programmes to develop consciousness among the poor for their rights as citizens. They develop local leadership among the deprived communities who develop the confidence to negotiate with political leaders and bureaucrats for their rights. These grassroots activists encourage and lead collective actions of local residents and in some instances have successfully obtained basic services such as drinking water and shelter, and prevented eviction from their settlement by the authority (Desai 1995; Mitlin 2001; Van Eera 2008). Such suc- cess stories boost the morale of the poor for collective actions to get amenities. Such struggles do contribute to developing a consciousness for citizen’s rights. The poor people are increasingly becoming conscious of their rights and are asserting themselves to attain those rights. Sometimes, they collectively launch a struggle to get justice. But these are frag- mented and do not have the wherewithal to sustain their confronta- tion with the dominant classes. The organizations of the deprived communities dominated by the middle class are more preoccupied with issues of identity than with the wretched condition of their brethren. Nevertheless, grassroots struggles of the oppressed people resisting and confronting the State and the dominant classes for their rights to protect natural resources, land, wages, etc., and also against atrocities and injustice, are frequent and innumerable. Their forms and nature vary. They are isolated and are missing a larger political perspective that relates their issues with the political economy of the land. Hence, their strength to sustain these struggles is limited. Some RCS organizations do play a role in co-ordinating and sustaining these struggles. Their involvement in the people’s struggles helps them to identify them with the oppressed and to become more reflective in their understanding of social reality. RCS activists are relatively well articulated than HCS on public issues. These organizations and activists are actively engaged in raising their voice on the issues related to violation of public morality, injus- tice to poor, freedom of expression, etc., by the State and the political class, irrespective of party and dominant strata. They write articles in media providing facts and analysis, collectively submit petitions and give memoranda to authorities demanding an inquiry into incidents, organize public discussions, stage demonstrations, etc. In some cases, they file PILs to the court for justice. These activities influence public opinion. Though the presence of RCS organizations is quite visible and the State is often compelled to take cognizance of their demands, their capacity of mass mobilization so far is limited. In terms of space, RCS is on the periphery of the CS. But with unfolding contradictions of the neoliberal economy, the circumference of RCS organizations in civil society is expanding. A few of the socially sensitive activists and groups of HCS are coming closer to RCS. Different segments of RCS have different ideological positions on the nature of power relations in society, the character of State and political class, political economy in general and neoliberal economy in particular. Their premise on Indian culture and tradition and their strategies for transformation vary. But, more often than not, they work in alliance with each other on most of the issues related to inequal- ity and deprivation, violation of human rights, shrinking democratic space, etc. All of them increasingly realize the limitations of their ideological framework in comprehending changing social realities. But either because of their constant engagement in the field and/or because of their lack of aptitude and/or arrogance about their ideol- ogy, many of them are not inclined to engage in a reflective analysis of their own experiences and to unlearn their pet theories. This is a major stumbling block to meet the increasing challenges of rising sectarian forces and the neoliberal political economy which is in crisis. It is a time for different organizations of RCS to critically interrogate their ideological framework, and evaluate their own trajectory of struggles to locate their achievements and failures. Simultaneously, there is a need felt among many activists to interrogate hegemonic cultural values and perspectives, and to evolve a counter-culture around the principles of justice and equality. Ghanshyam Shah is a retired Professor, Jawaharlal Nehru University, New Delhi; and former Director, Centre for Social Studies, Surat. 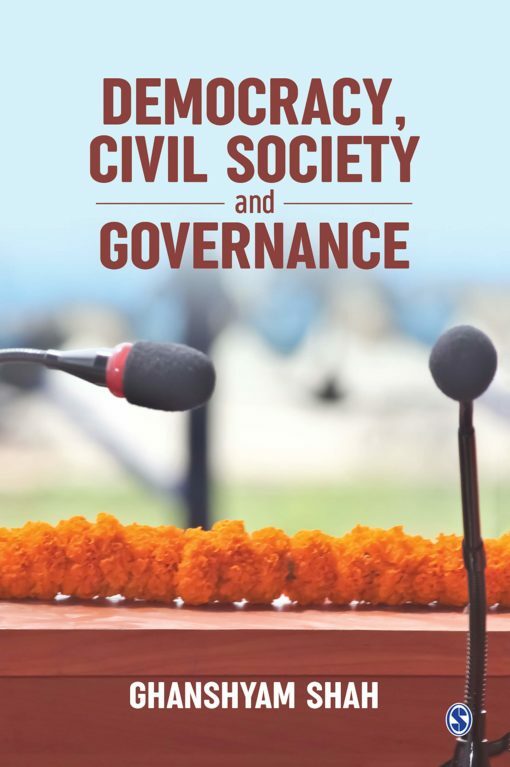 This is an excerpt from Democracy, Civil Society and Governance, written by Ghanshyam Shah and published by SAGE publications. Republished here with permission of the author and the publisher.